Monarch Air Group provides private air charter in Saint Tropez, France. Our clients benefit from top-notch service, unrelenting dedication to safety, wide selection of aircraft, and years of experience in chartering private jets. To obtain a free quote, please use our online quoting tool provided below, or call toll free 1-877-281-3051. Monarch Air Group offers private jet charter services to and from St. Tropez, France. St.Tropez is a beautiful town in southern France, situated on the French Riviera. It has long been the renowned travel destination in France, and today St.Tropez offers 40 breathtaking sandy beaches, like Bouillabaisse Beach, the Pampelonne Beach,Tahiti Beach, and Caneliers Beach with well-known restaurants and luxury yachts. St.Tropez blends an eclectic atmosphere of a famous beach resort with old-world charm of a small fishing port. It boasts the picturesque cobbled streets alongside old harbor and has easy access to nearby towns such as Cannes, Aix-en-Provence, Nice, Marseille, and Toulon. The most popular tourist attractions are the Vieux Port (Old Port), the Place aux Herbes, Place des Licesthe and the Quai Jean Jaures. 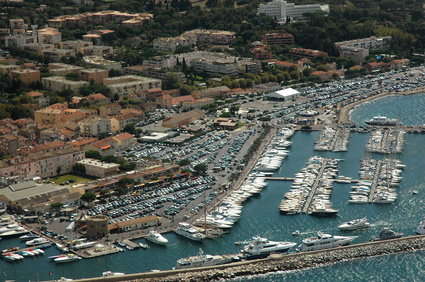 St.Tropez is serviced by Marseille Provence Airport (MRS), Toulon Hyeres Airport (TLN), Nice Cote d’Azur International Airport (NCE), and La Mole Airport (LTT). 1. CEQ, Mandelieu, Cannes, France. 2. CTT, Le Castellet, Le Castellet, France. 3. FRJ, Frejus, Frejus, France. 4. JAH, Agora Helipad, Aubagne, France. 5. JCA, Croisette Heliport, Cannes, France. 6. JLP, Juan Les Pins, Juan Les Pins, France. 7. LTT, La Mole, Saint Tropez, France. 8. MCM, Fontvieille Heliport, Monte Carlo, Monaco. 9. SXD, Sophia Antipolis, Sophia Antipolis, France. 10. TLN, Le Palyvestre, Hyeres, France. 1. Byblos Saint Tropez, Avenue Paul Signac, Saint-Tropez. 2. Byblos Saint Tropez, Avenue Paul Signac, Saint-Tropez. 3. Byblos Saint Tropez, Avenue Paul Signac, Saint-Tropez. 4. Byblos Saint Tropez, Avenue Paul Signac, Saint-Tropez.